Jiuzhaigou Valley is a mountainous area with series of lakes and waterfalls containing clear, mineral-rich water. The natural beauty of the site lies in the over 100 strange-coloured lakes and terraces. They are the result of karst erosion and deposits. Some of the lakes are swamps. Others contain large quantities of grass, underground rivers or a wealth of algae. The Valley is located in China's Northern Sichuan Province, in the Min Shan mountain range. At the admission of the site as a WHS in 1992 there was large concern for its conservation: "..hundreds of thousands of visitors pour all over the reserve uncontrolled, picking flowers, throwing stones in the lakes, singing and camping and even lighting fireworks and rockets to brighten up the night air". In 2007 things have improved a lot: staying overnight in the park is forbidden, visitors have to stick to a fixed walking trail or use the park buses and there are sweepers everywhere to clean up after the tourists. On my first day at the park I started out at 8 a.m.. When I left the hotel I could already hear the chatter of the hundreds of other tourists wanting to get into the park. Fortunately there were no queues for buying a ticket though (the price of the ticket is a rather steep 220 Yuan, plus 90 Yuan to use the park buses: over 30 EUR in total). I then took one of those buses to Mirror Lake, a little over half way into the park. There I started to walk back to the exit (14 km). I followed the well-signposted plank trail. Although the views are sometimes better from the road, I liked walking here. There weren't many people around and it was quiet enough to observe colourful little birds eating the berries that are plentiful here. The turquoise water of the lakes contrasts splendidly with the red and yellow autumn leaves. On the second day, I could reuse the entrance ticket but had to buy a new bus ticket. The weather was the same as the day before: cloudy and cool, but dry. This time I let one of the buses take me all the way up to The Virgin Forests, about 32 km from the entrance. From there I walked down in about 3 hours via Grass Lake, Swan Lake and Arrow Bamboo Lake to Panda Lake. This is more a kind of mountain trail than the path I followed on the first day. A high variety in trees dominates the view here. It ended at pretty Panda Lake, the bluest of all lakes. One can spend two days easily here at Jiuzhaigou as the park is large and there are many points of interest. I didn't even see half of them. This is the most crowded sites of any kind in China, with fall peak visitor at 30,000 in the park. The admissions are about US$40, the ride from any decent hotel is about 45 minutes if you leave early in the morning. Fly from Chengdu, the jumping-off point for Western China, or 14 hour perilous, but scenic bus ride from there. Why? Because it is all worth it. Alpine forest and mountains refelcted in chrystaline lakes. Waterfalls. Alpine meadows and wild flowers. Granite outcrops. The water is so high in calcium, that bateria and algae do not grow. What you get is deep, clear, blue water. The fallen logs are clearly visible on the bottom. So in one photo, I captured the trees, their reflection in the water, and the logs at the bottom. (Polarizing filter highly recommended). I went in August, as it is almost impossible to get in in October, peak foliage season. Of the perhaps 30 or so places I have visited in China, this is the cleanest, and park management tries hard to keep it clean. There is only one place to eat, a huge B grade Chinese cafeteria, very little facilities, no smoking, and a Tibetan worker appears every 5 minutes to pick up whatever trash the Chinese visitors throw. Once in the park, you travel by LPG mini-buses that go around in a circuit to most of the scenic spots. Walking around by yourself off the designated trails is permitted but not encouraged or recommended. The park is big, and elevation range from 2,000 to 3,000 meters. Stick to the program for maximum effect. There are so many wonderful sites, you are going to miss some of it anyway. What's on the official trail already made a 500 slide photo album. This site is not well-advertised to the Western world (like the Great Wall), perhaps there are already more Chinese tourists than they can handle. But it will give a Western visitor a completely different impression of China. Think Yellowstone in China. Jiuzhaigou park is probably the most beautiful place I have ever been to and I have been around! I was there during the winter of '01. If you go then, you should be prepared. It was extremely cold and there was not much in the way of comfortable accomodation, either in or outside of the park. Freezing your tail off is no fun, but the frozen waterfalls, unbelievable mountains, and multicolored lakes made it worth it. The only way to describe it is otherworldly. 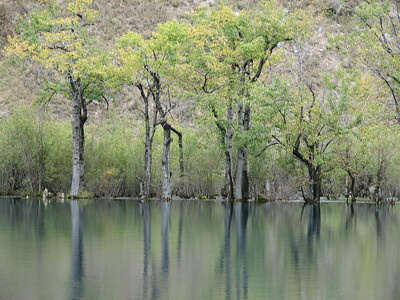 Natural sites with indigenous human population: Jiuzhaigou (literally "Nine Village Valley") takes its name from the nine Tibetan villages along its length. Seven of them are still populated today by 130 Tibetan families. Late Pleistocene: From the Quaternary to the late Pleistocene period, the altitude of many Jiuzhai Valley mountains was over 4,000 meters (13,123 feet), close to the snowline. As the glacial climate approached, glacial action took place in alpine areas, and glaciers extending down to 2,800m (9,186 feet) valleys, leaving behind terminal and side moraines and dike barriers which blocked the water and helped to shape lakes. Recommended for combination by AB: "the Chinese authorities should be requested to consider Jiuzhaigou and Huanglong as a single site"
77 Community Members have visited.